View cart “PURETi Fresh 16 oz Bottle” has been added to your cart. Window Cleaner and Odor Eliminator in One. PURETi Fresh is an environmentally friendly window cleaner that also cleans the air. PURETi’s advanced form of photocatalytic titania uses the power of light to keep glass cleaner between washings and transforms the window into an odor-eliminating air purifier. 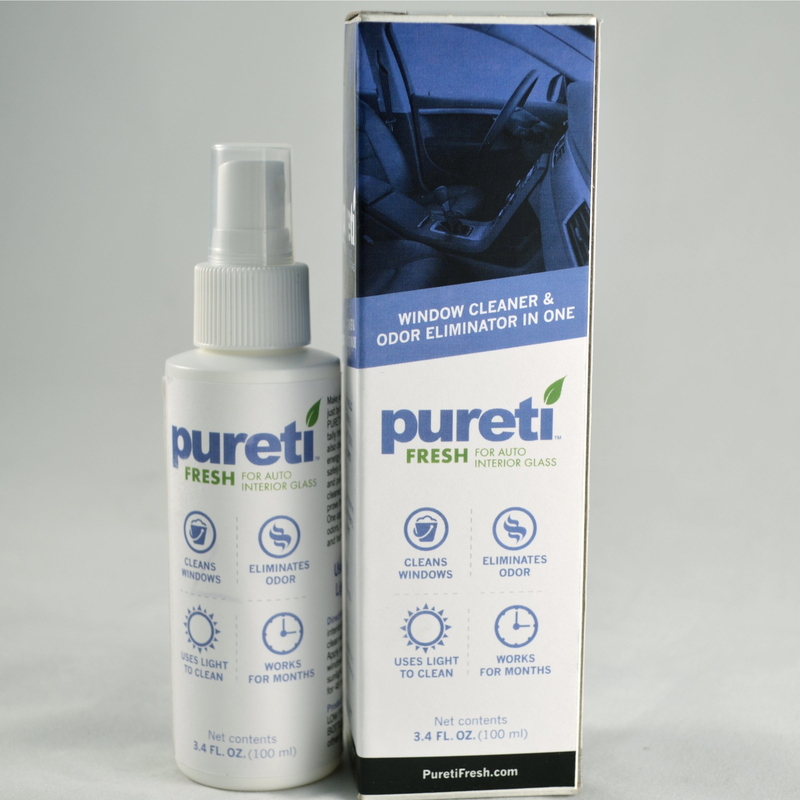 In the presence of sunlight, PURETi Fresh oxidizes the organic micro-particles that cause odors and cloud the glass. A single application works for months. Make the air inside your car or truck cleaner just by washing your windows once with PURETi Fresh for Auto Interior Glass. Individual boxes also available for sale. See our storefront. Uses Light to Clean – UVA light from the sun provides the power to naturally break down organic pollutants on the glass and in the air. Cleans Windows – For best results, just spray on and wipe clean with a microfiber towel. Eliminates Odors – Pet, smoke, food and human odors are all caused by organic compounds. 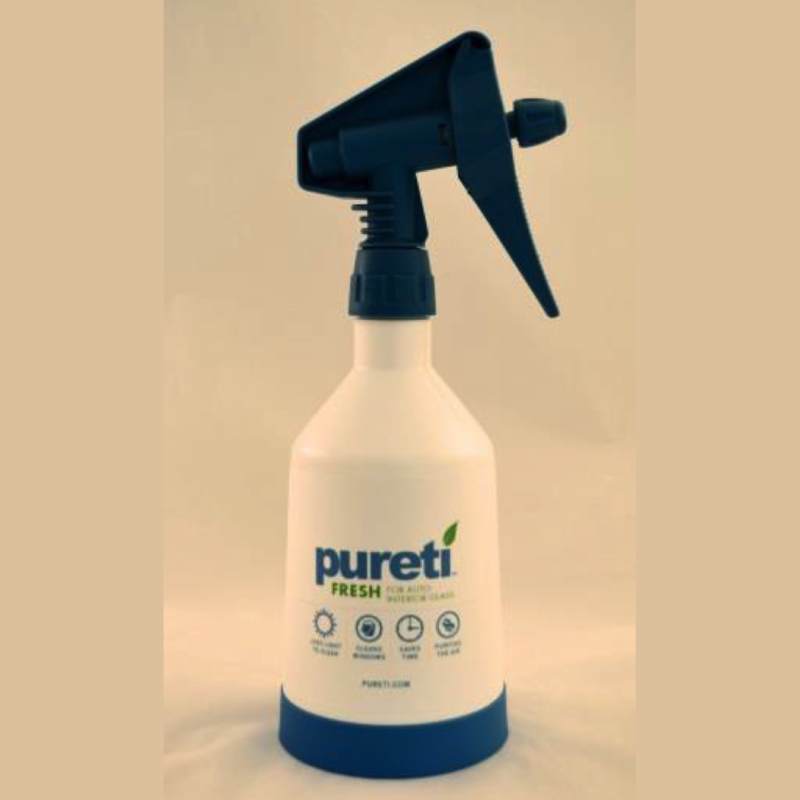 PURETi uses light to destroy odors as soon as they touch the windows. Keep Windows Cleaner – PURETi works between washings by breaking down the particles that cause the buildup of that nasty film on your windows. Do’s – Apply only to interior glass, Spray on, wipe clean with microfiber towel, Expose the car to sunlight. Dont’s – Don’t Spray on leather or exterior glass, Don’t allow the product to freeze prior to application, Don’t Dilute or mix with other products.